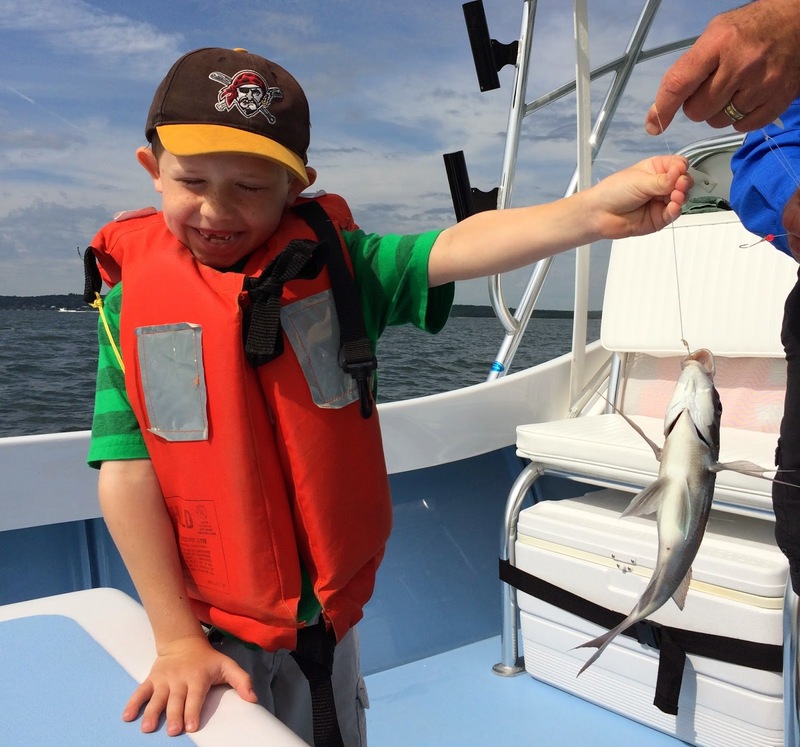 First fish: Logan McDermott (7 years old) with his first fish, a scup he caught off Jamestown, RI last week. Weakfish (Squeteague) bite coming back. 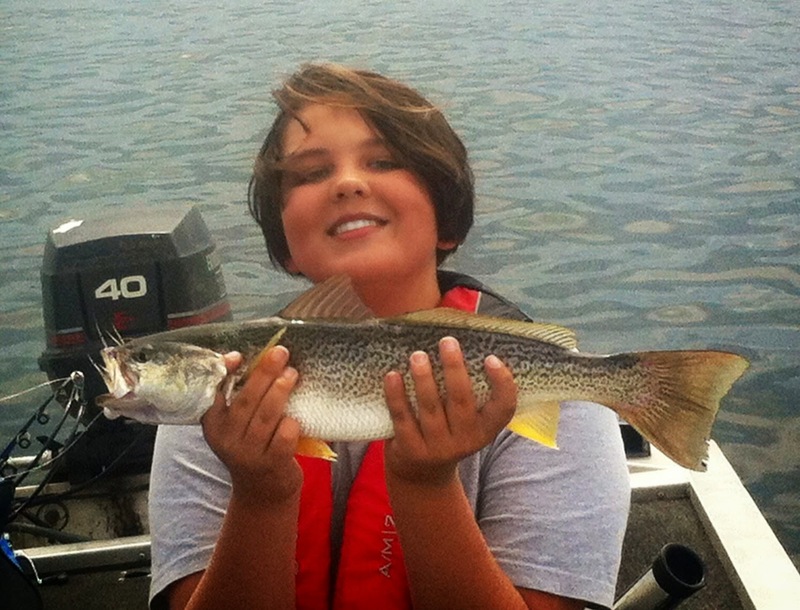 Logan Lemay of Bristol with the 21” weakfish he caught in Greenwich Bay. 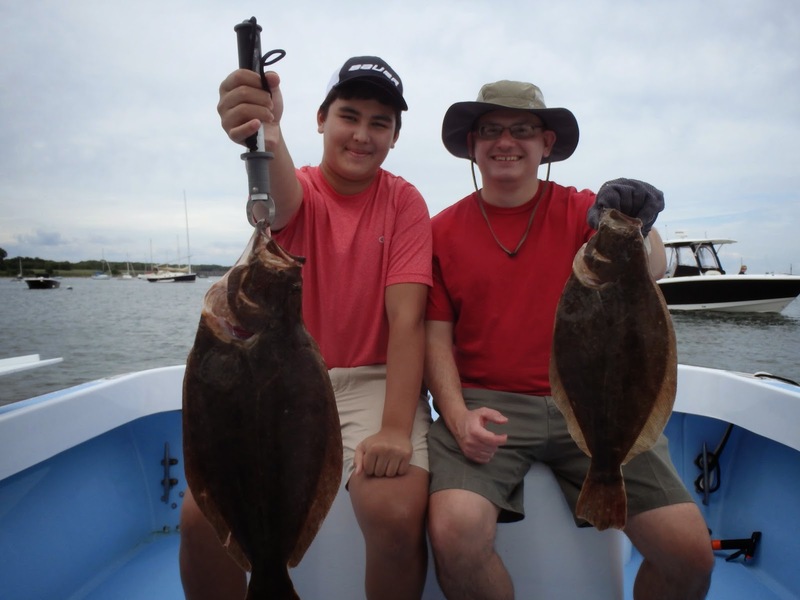 Alex and Joe Noga of Rye, NY with two of the fifteen summer flounder (fluke) they caught off Newport Saturday on a family fishing trip. Christine Blount and her son Capt. Nicky Blount, both from Narragansett, RI, proudly display a jumbo sea bass caught aboard the Frances Fleet. Fishing with friends: Chris Gasbaro (right) found this 26” summer flounder one mile off Newport’s Seal Ledge, he fished Monday with his friend and business associate Jason. Family fishing at Block Island: Al Bacon and his son from Austin, TX with a 33 pound striped bass caught with Captain John Sheriff of Fish On Charters. As a fisherman, I have adopted the saying “It’s not always about the fish”. Just as important are the lessons we learn from fishing… discipline, patience, creativity, self reliance, conservation and how to have an adventure. However, the most important fishing lessons are obtained through the conversations and relationships we develop with fishing companions. To this day, some of my fondest fishing memories include fishing with my father, son, wife, brothers, brothers-in-laws, nieces, nephews, and friends. Everyone who catches a fish is happy. I have a wall in my office with photographs of people (young and old) who have caught fish on my boat and every one of them has a smile on their face. Fishing feeds our sense of self worth, makes us feel successful and gives us a sense of accomplishment. A sense of accomplishment and enhanced self image that is particularly important to young people. Bonito and false albacore are speedsters know to strip line off a reel at lightning speed. They are two of the most challenging fish to catch, yet they are the most fun. 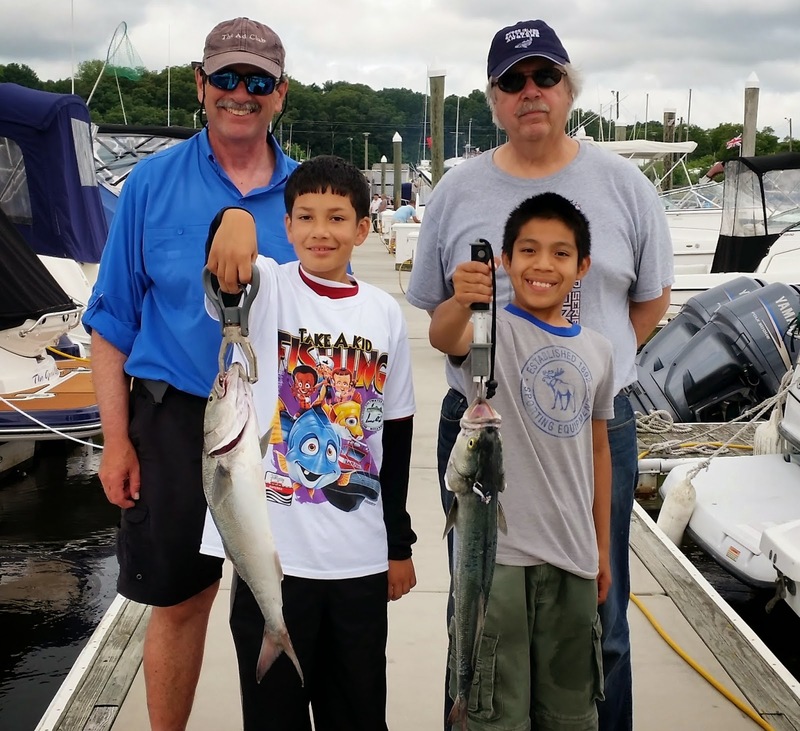 This Monday, July 28, 7:00 p.m. learn how to target and catch bonito and false albacore at a Rhode Island Saltwater Anglers Association (RISAA) seminar at the West Valley Inn, West Warwick, RI. Guest speakers will be Capt. Eric Thomas and Roger and Susan Lema. Capt. Thomas from Teezer77 Charters, Portsmouth, RI was a featured speaker on false albacore and bonito fishing at the New England Saltwater Fishing Show; and Roger and Susan Lema are two local expert anglers that target these fish (and do a lot of catching) every day once they arrive. Non-members requested to make a $10 donation to the Scholarship Fund, RISAA members attend free. A meeting of Rhode Island's Atlantic States Marine Fisheries Commission (ASMFC) members will be held on Thursday, July 31, 4:00 p.m. in the Large Conference Room in the Coastal Institute Building at the URI Bay Campus in Narragansett. The purpose of the meeting is to review and discuss the agenda for the upcoming August 5-7 ASMFC meeting in Alexandria, VA with our commissioners. Anyone may attend and offer input on the agenda items. The agenda for the ASMFC meeting is available on the ASMFC's website at http://www.asmfc.org/home/2014-summer-meeting. Key issues expected to be on the agenda include eels, striped bass, fluke and spiny dog fish. For further information contact Bob Ballou at Robert.Ballou@dem.ri.gov. 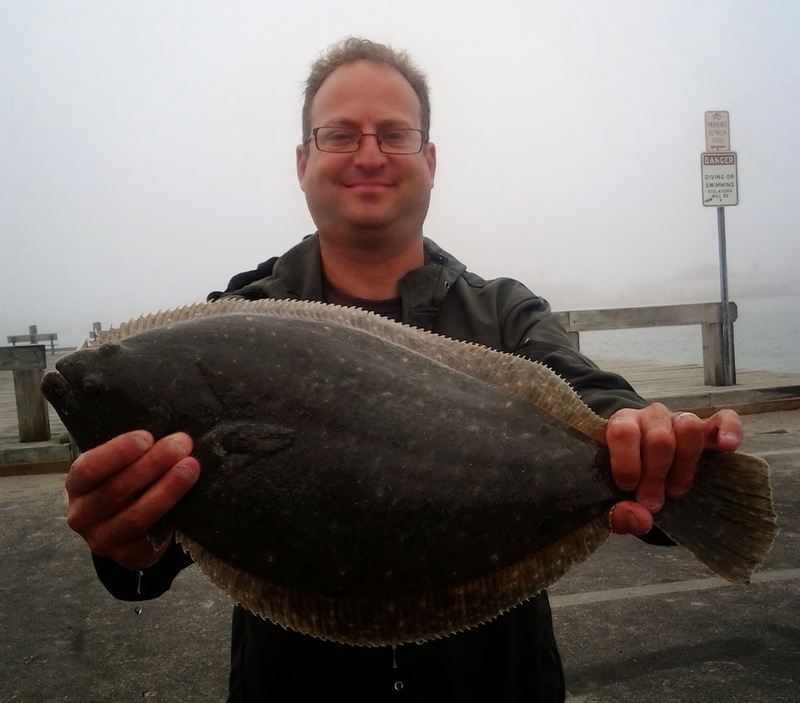 Summer flounder (fluke) fishing has been good along southern coastal shores, at the Sakonnet River mouth, off Newport and the Harbor of Refuge in Narragansett and around Block Island. However in Narragansett Bay it has been a bit slower. 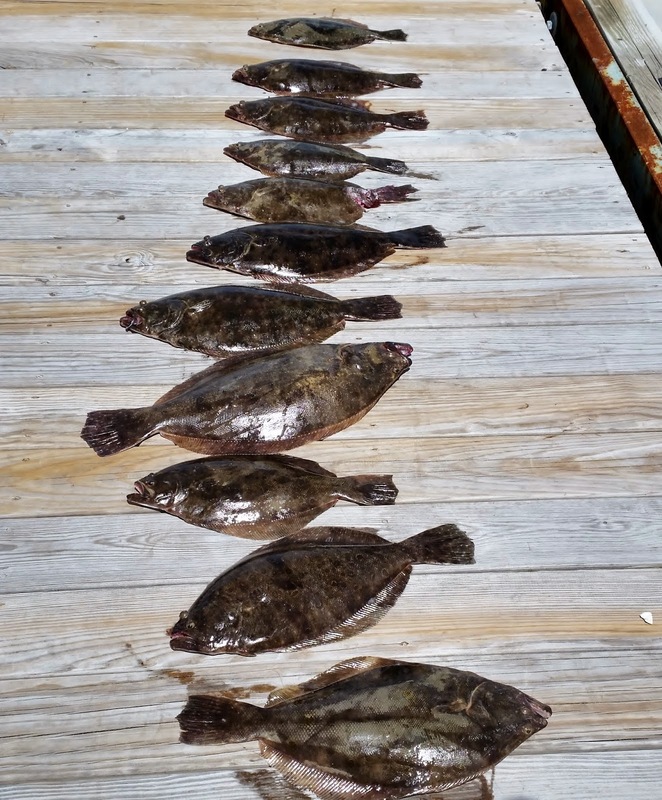 I experienced a strong summer flounder bite off Newport Saturday when the wind and tide were in line, however, with a northeast wind, conditions were not ideal Sunday and Monday in Narragansett Bay for most of the day. Angler Eric Duda said, “Fished about 2 miles south of the Sakonnet Light house on Saturday. Left at 8:00 a.m. and returned at 3:00 p.m. Light wind until about noon, 1-2 foot seas. Caught about 14 fluke, 7 keepers, largest around 22”. 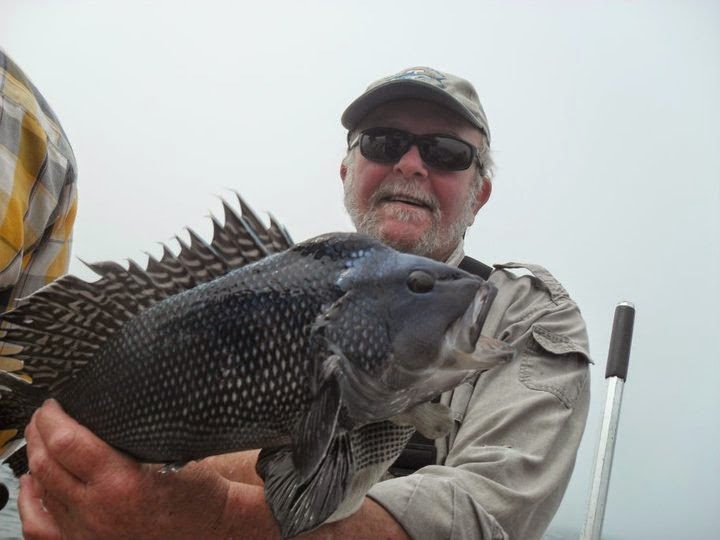 Tons of small BSB in 14” range, kept 2 big ones.” Roger Simpson from the Francis Fleet reports good fluke and black sea bass fishing on nearly every trip this week. 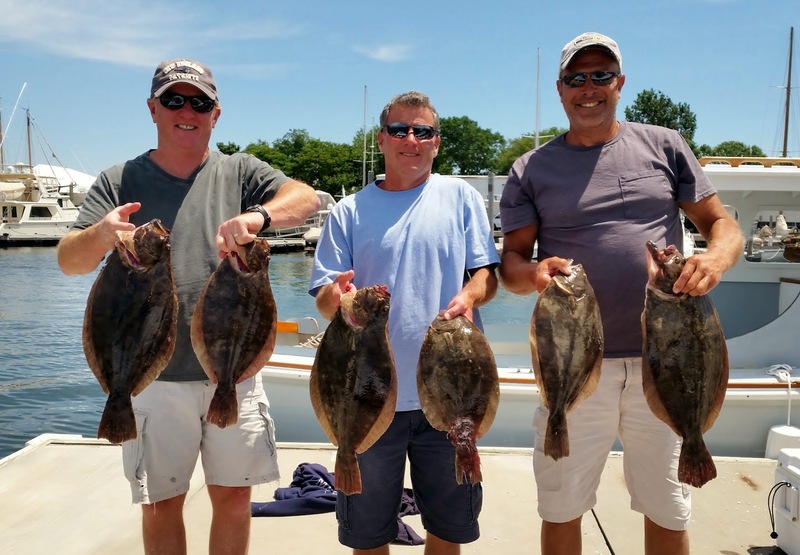 Roger said, “A good number of big fluke this week with quite a few fish in the 8 to 9 lb range… with a trio of fish in the 9 lb range (Friday) battling it out for the pool.” Minimum size for summer flounder in RI is 18” with an eight fish/angler/day limit. Scup. Manny Guerzon of Quaker Lane Outfitters said, “Scup are everywhere just wet a line with some squid on it and you will catch them.” Michael and Logan McDermott landed scup to 15” while fishing on the west side of Jamestown north of the bridge last week. Scup minimum size is 10” with a 30 fish limit. Visit www.dem.ri.gov for special areas from shore were the size limit is 9 inches. Black sea bass. 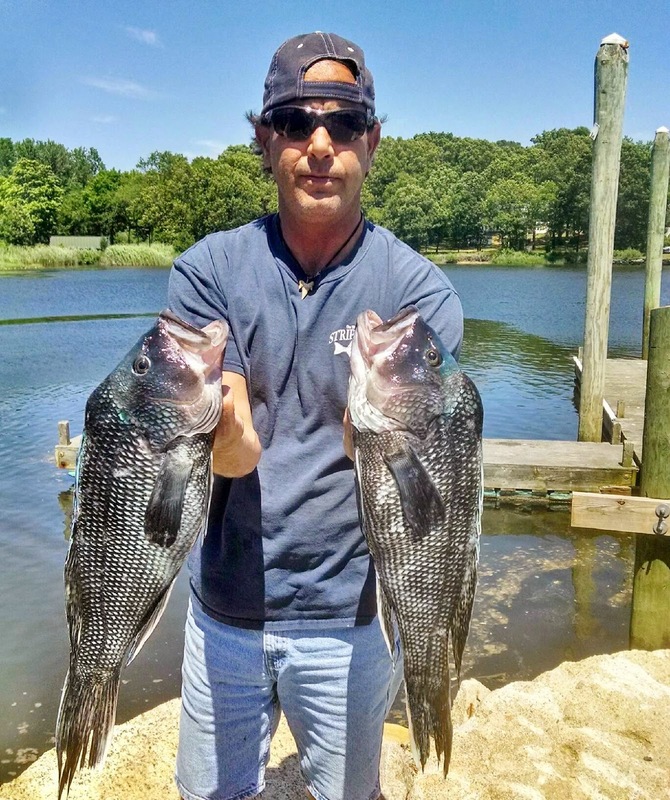 “We had a six pound black sea bass caught Saturday and customer Mike Swain of Coventry and his two fishing partners easily caught their limit when fishing in the Breton Reef area off Newport Saturday.” said John Wunner of John’s Bait & Tackle, North Kingstown. 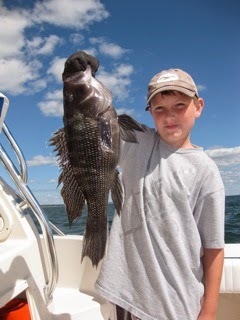 Black sea bass minimum size in RI is 13” with a three fish/angler/day limit. Anglers catch them as they target fluke, fishing the bottom with squid. Steve Brustein with some of the fluke and black sea bass caught off Seal Ledge, Newport last week. First place thresher and overall tournament winner was a 295 pound thresher caught by Adam Littlefield (right), North Kingstown with captain of the Striker, Russ Blank. The Snug Harbor Marina Shark Tournament was held this weekend. 251 pound mako shark took first place in its category. Tom Lai, Bill Ward (Capt. and angler), John Durand and Ken Lai. Lary Norin with a 22” summer flounder (fluke) he caught from a State dock in South Kingstown on his lunch hour Tuesday. 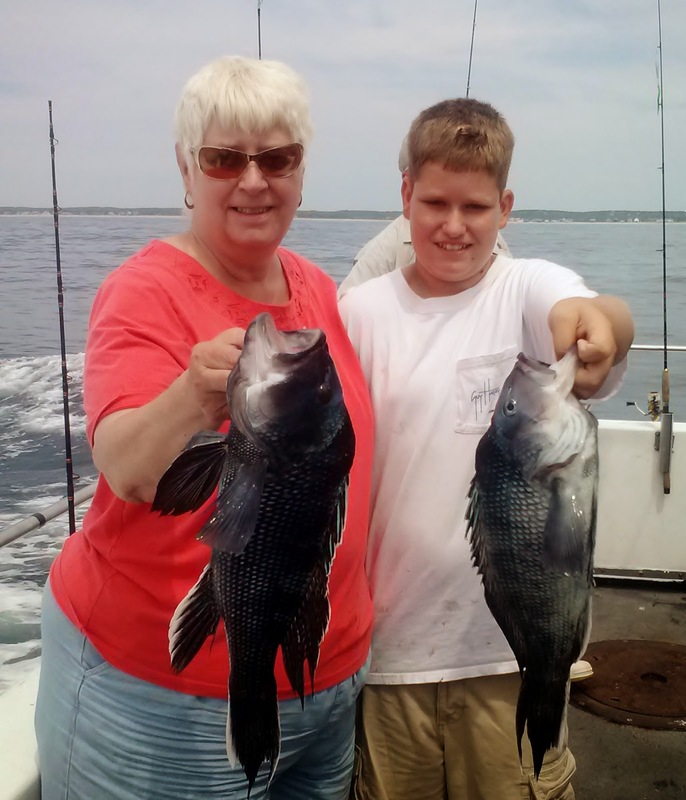 Five pound black sea bass caught aboard the Francis Fleet last week by Ginny Reed of Bristol, RI and her grandson Cole. Snug Harbor Marina, South Kingstown, ended their two day shark tournament Sunday with a 295 pound thresher taking the tournament’s top prize. Adam Littlefield of North Kingstown caught the fish while aboard the Striker captained by Russ Rand. Al Conti of Sung Harbor said, “57 boats and 200 anglers participated in the tournament. And, 43 fish were tagged and released with only eight fish captured. This is a great use of the resource when you start to think about the economic impact of such a tournament”. 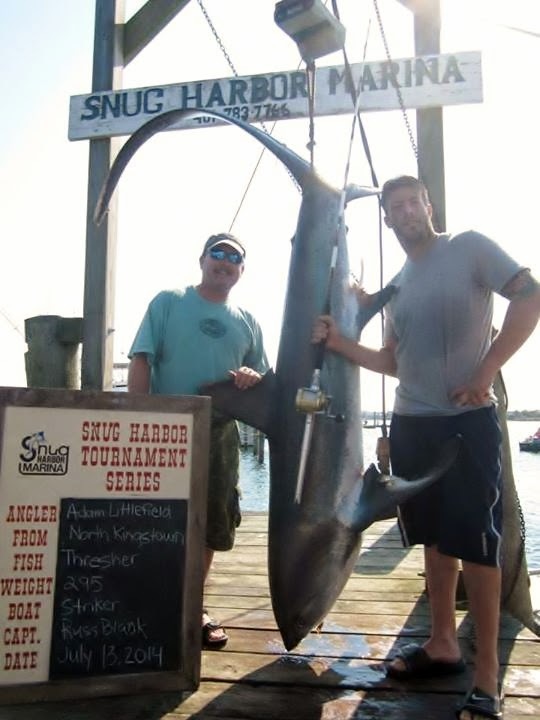 Elisa Martin of Snug Harbor said, “The sharks topped fishing news this week but there was a lot of other news too.” Proceeds from the tournament are being donated to the Rhode Island Saltwater Anglers Association (RISAA) and the Recreational Fishing Alliance (RFA). “We had anglers fishing the Gully, the Suffix and the Horns area and some went all the way to the edge. But you do not have to go that far.” said Elisa Martin. 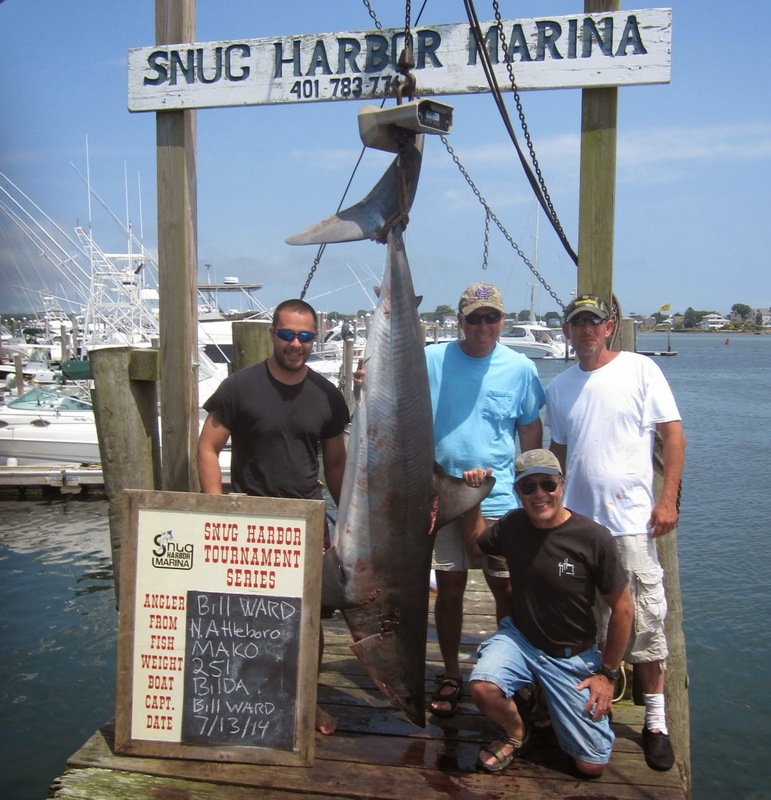 Bill Ward of Mansfield, MA took the mako shark first place prize with a 251 pound fish. No blue sharks were weighed in at the tournament. The Rhody Fly Rodders are holding their summer fishing meeting Thursday, July 17, 3:00 p.m. to dark at the Narrow River. A grill, condiments, water and chips will be provided, but bring your own food items to grill (and a chair if you want to sit). The head guide for the meeting is Geno Rapa. Meeting at the Sprague Bridge parking lot at Narrow River on RT 1A. Contact Peter Nilsen at pdfish@fullchannel.net with questions. The Narragansett Chapter of Trout Unlimited (#225 ) will hold streamside meeting Wednesday, July 30, 6:00 p.m. at the Arcadia Management Area Check Station, Rt. 165, Exeter, R.I. Hot dogs, hamburgers and beverages will be available. All members and guests welcomed. For information contact chapter president, Ron Marafioti at (571) 643-1452. Shore fishing. 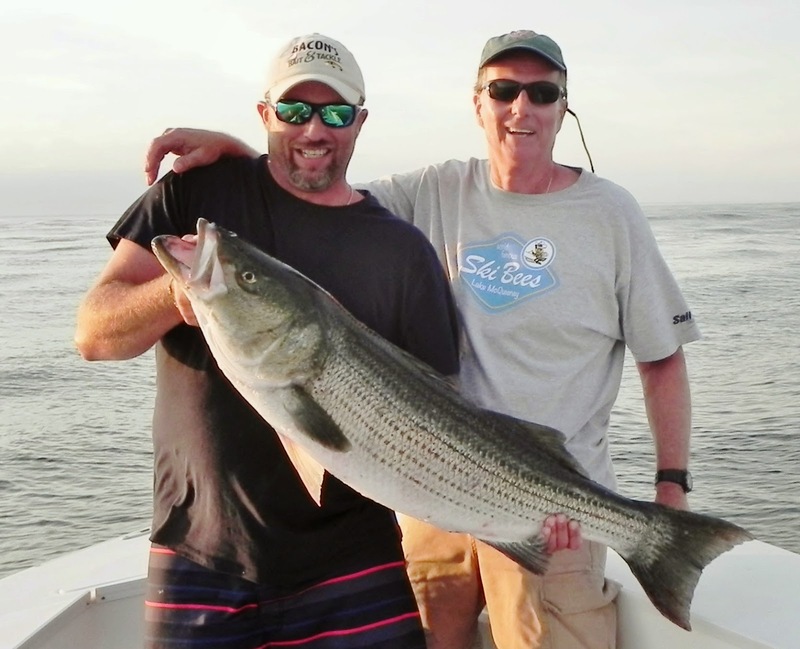 “30 and 40 pound striped bass are being caught at night with eels from the Charlestown Breachway along with large bluefish.” said Julian Trozzi of Breachway Bait & Tackle, Charlestown. Manny Macedo of Lucky Bait said, “Scup fishing has been great all over with 12 and 14” fish being caught. Guys have not been catching their thirty fish limit, but they are going home with fifteen or so good sized fish. Scup fishing is good at Colt State Park and even at the Warren Bridge where we don’t normally see scup until later in the season.” Dave Henault of Ocean State said, “Bass still in Providence and Seekonk Rivers”. A lot of shaking going on: Al Gag with his new Whip-It-Fish lure that rolls from side to side as it travels underwater while shaking its tail. “Vibration and color are important when using soft plastic baits.” said Al Gagliarducci, owner and designer of Al Gag’s Custom Lures since 1978. He spoke to 250 fishermen last week at a Rhode Island Saltwater Anglers Association (RISAA) seminar on ‘Fooling fish with soft plastics’ at the West Valley Inn, West Warwick, RI. “Fish can feel vibrations and can tell the difference between light and dark…That’s why our lures are designed to move back and forth vibrating as they swim through the water.” said Gagliarducci. And, in regard to color the rule is simple. “Bright day, bright (or light colored) lure; dark day, dark colored lure.” said Gagliarducci. Al Gag’s Custom Lures came out with a new lure this year… the Whip-It-Fish. Like its predecessor the Whip-It-Eel, the new lure is PVC rubber, can be used in fresh or saltwater, comes in various sizes and colors and uses the same weighted heads and hooks. Al Gag said, “The Whip-It-Fish has a unique design paddle tail that allows the lure to roll from side to side as it travels though the water.” The lure mimics a variety of bait fish including shad and silversides and is available in 3” to 6” sizes. “Throw one of these Whip-it-Fish off the stern and deadhead it in a rod holder and you will be surprised at what you catch. The lure bounces off the bottom as the boat bobs up and down.” Gagliarducci also showed his new double hook fluke rig that can be use as is or weighted using a three way swivel, however, he said, “If you are going to use a three way swivel to weight the lure make sure you have an extra long leader... about five feet… to allow that lure to bounce up and down off the bottom." Visit www.algagsfishinglures.com for information and video links. Paul DeMarco of North Kingstown, Russ DeMarco and Dave Zartarian of South Kingstown with some of the twelve summer flounder they landed off Newport Saturday. All keepers shown below. Liam Teixeira and his dad Bill of Bristol, RI landed this 36” striper last week while trolling with tube & worm in Narragansett Bay. Steve Weinstein, Cranston, with the 33 inch, 17 pound bluefish he caught Saturday while fluke fishing. Chris Catucci of Warwick with the 40 plus inch striped bass he caught and released while fishing from shore in Warwick last week. 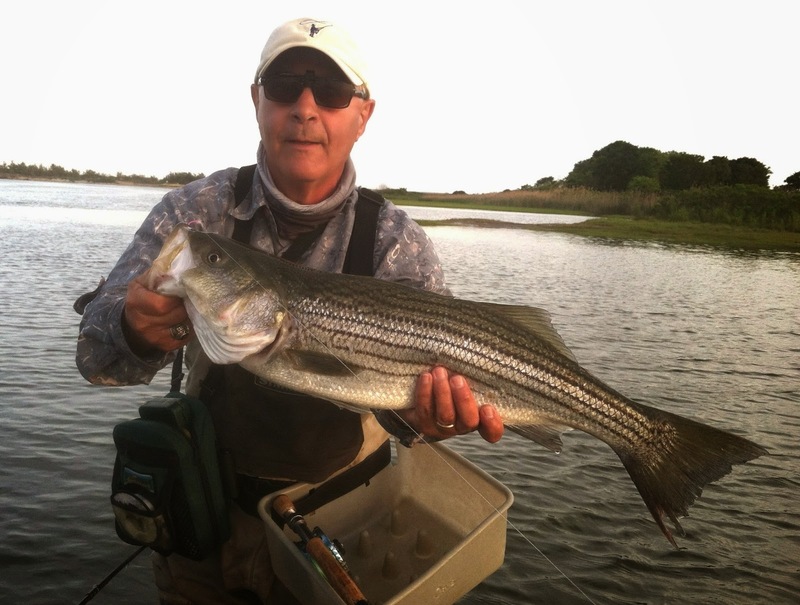 Noted local fly fishermen Ed Lombardo (in photo) and his fishing partner Richard Santos caught striped bass to 36” on Narrow River, Narragansett last week. Summer flounder (fluke) fishing is great. The best season I can remember in a long time. This week anglers continued to report great fishing along the southern coastal shore from Pt. Judith to Watch Hill, fishing off Newport, Jamestown and Block Island has been good with the mouth of the Sakonnet River yielding fish too. If you have not given it a try, now is the time. Our fluke fishery is in good shape, so good, fish managers lowered the minimum size in RI last year and this year to 18” with an eight fish/angler/day bag limit with a fluke season running from May 1 to December 31. In May, fluke move in shore from deep Continental Shelf waters where they spend the winter. They stay inland until October and then move back to the deep water. Fluke return to the same areas, bays, etc. year after year. The local abundance of flounder, including summer flounder or fluke, has been on the rise. Studies show abundance moving from off Maryland and Delaware in the early 1960’s to off the coastal shores of NY, CT and RI today. Some scientists (including Dr. Jonathan Hare, NOAA’s lab chief in Narragansett, RI) believe climate change is contributing to this movement. Fluke are a flat fish with two eyes on the same side of the fish. They are bottom fish that do not look aggressive, but they will chase bait aggressively and eat the same bait that bluefish and striped bass eat. The difference is that they feed off the bottom. They can be caught from a boat (usually while drifting) or from shore with little knowledge, so they are an ideal catch for beginners and children. Fluke are chameleons; they change color to blend with the bottom. Largest fluke on record is 26.6 lbs. and 36” long. 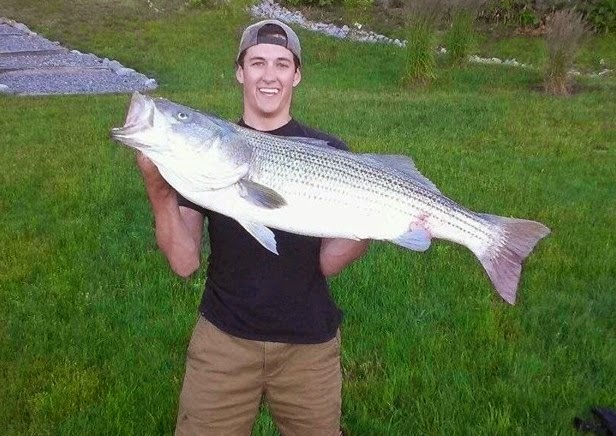 The RI State record is a 17 pound, 8 once fish caught by G. Farmer or Warwick, RI in 1962. Visit http://newenglandboating.com/videos/fall-fluke-fishing.html for a video with Capt. Dave Monti, Kelly Parker and Tom Richardson, co-hosts of New England Boating TV, they fish for fluke off Jamestown, RI and make Capt. Monti’s Fluke Cocktail. Visit www.youtube.com/watch?v=18LMdrcMZi4 for and interview with Capt. 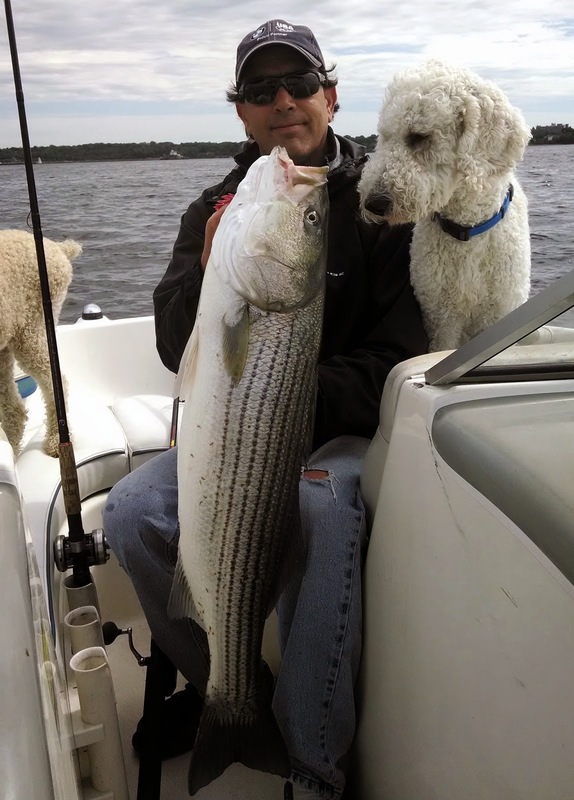 Charlie Donilon of Snappa Charters, Pt. Judith, RI on how and where to catch fluke off Block Island and coastal shores. Atlantic sturgeon is among the oldest fish species in the world and can be found from Canada to Florida. It was in great abundance when settlers first came to North America but has since declined due to overfishing and water pollution and is considered an endangered species. They can grow to 14 feet and weigh up to 800 pounds and travel up rivers to spawn in brackish water. When juveniles reach 30 to 36 inches they move into near coastal waters. Offshore. “We caught and released eight Blue Sharks on our first offshore trip on Thursday. As an added bonus Whales, Sea Turtles, Sunfish, and Dolphin sightings can be expected on any trip offshore right now.” said Capt. Rick Bellavance. Elisa Martin of Snug Harbor Marian said, “Customer Bill Fazano landed a Mako and a Thresher shark this weekend at Tuna Ridge. The fish must have been good size as he had to respool his reels and check gear due to the all the action.” Shark fishing for mako and thresher sharks has been good offshore with lots of bluesharks being caught said Capt. Gene Kelly of the Montauk Sportfishing Association. Last week, first place winners of the Montauk Marine Basin shark tournament included a 353 lbs. mako, a 355 lbs. thresher and a 311 lbs. blueshark. Flukezilla: Lary Norin of Cumberland, RI with the 31”, 12.06 pound summer flounder (fluke) he caught when fishing in the Jamestown Bridge area on Friday. 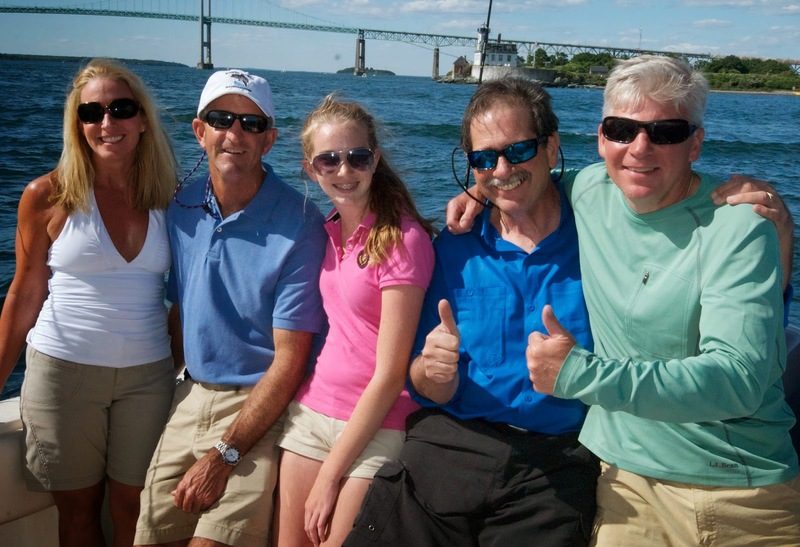 New England Boating TV is doing a Newport, RI program this season. Here on the “fishing” segment shoot Friday are co-host Parker Kelly; Al and Christina Elson of Striper Marina, Barrington, RI; Capt. Dave Monti (who served as fishing guide); and show co-host Tom Richardson. Bluefin on the troll: Jack Leyden of North Kingstown, RI and Doug Poscich of Stonington, CT with a 60 pound bluefin they caught at Tuna Ridge, 20 miles southeast of Block Island Sunday. Things were looking up for dogfish (small sharks). They received a lot of positive press last year about their potential value to fishermen (as a species to be fished), as table fair for consumers and as a boost to fishing communities in general. The idea of marketing and promoting dogfish for the dinner plate was a good one… there are plenty of dogfish and they are easy to catch. What made it even better is that both commercial and recreational fishermen do not like the small shark. Spiny dogfish are relentless predators. They steal bait and eat forage fish, clog fishing nets and are caught as by-catch when recreational fishermen are targeting other species. So to find a solution that works, catching spiny dogfish and sell selling them as food for human consumption, was a win, win solution for fishermen and the consumer. Spiny dogfish are not yet in high demand as a food item in the United States but the idea is to build demand. They are popular on the international market and are often served as "fish and chips" in Europe. Last year when the industry movement to promote dogfish started, fishermen in RI and along the east coast were very positive about the dogfish market. The movement to promote dogfish as spices for table fare has spread to recreational fishing too. A number of internet inquiries and posts have explored ways to catch, clean and prepare spiny dogfish for human consumption. Last month a collaborative study on dogfish was published by Roger Williams University and the University of Rhode Island. The study examined the mercury (Hg) content in smooth dogfish, spiny dogfish, little skate and winter skate as well as in their prey (scup, butterfish, longfin squid and cancer crabs). The study area included Rhode Island Sound, Block Island Sound and Narragansett Bay. The study “Mercury bioaccumulation in cartilaginous fishes from Sothern New England coastal waters: Contamination from a trophic ecology and human health perspective” was published May 29, 2014 by Marine Environmental Research 99 (2014) 20-33 and can be found at www.sciencedirect.com . Study collaborators included David L. Taylor and Nicholas J. Kutil of Roger Williams University Department of Marine Biology and Anna J. Malek and Jeremy S. Collie of the University of Rhode Island Graduate School of Oceanography. No single study should set the tone and direction of a fishery and no doubt further studies on dogfish will be conducted. However, Dr. Taylor and his colleagues have raised a red flag about dogfish, one that should be seriously considered by consumers, scientists, fishermen and government officials. The New England Boating television program is in its second year airing on New England Sports Network (NESN) and they are doing a program on Newport, RI this season. This Friday, I served as fishing guide for co-hosts Tom Richardson and Parker Kelly. We landed four fluke in a matter of 40 minutes all keepers with the largest being 21”. Al Elson of Striper Marina captained on a new Pursuit 30 foot center console that he sells at Striper Marina, Barrington. Christina, Al’s daughter, served as first mate. New England Boating TV program features coastal towns that boaters/fishermen can visit and highlights shops, restaurants, tourist sites and where to fish when in the area. Visit http://youtu.be/q795Qdlg2w0 for an interview with show host Tom Richardson about the show’s first season and what you might expect to find on the website www.newenglandboating.com. Safe boating patrols will be stepped up on June 27 to June 29 in a joint operation conducted by the Department of Environmental Management’s Division of Law Enforcement. The effort is part of Operation Dry Water, a coordinated national weekend of Boating Under the Influence (BUI) detection and enforcement. It is aimed at reducing the number of alcohol-related and drug-related accidents and fatalities, and making recreational boaters aware of the dangers of alcohol and drug use on the water. During Operation Dry Water, DEM marine law enforcement officers will be out in full force on Rhode Island waterways, searching for boat operators whose blood alcohol content exceeds the state limit of .08 percent. Impaired boaters can expect to be arrested or face other serious penalties. 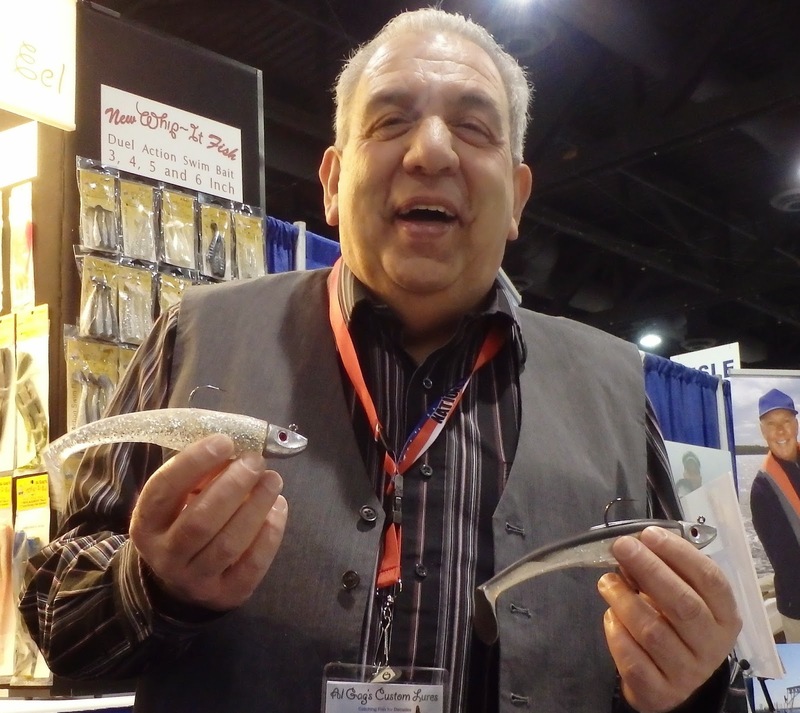 Al “Gag” Gagliarducci is well-known around the country (and world) as the owner of Al Gag Custom Lures, but he is also an expert fisherman that knows how to fool fish with soft plastic baits. 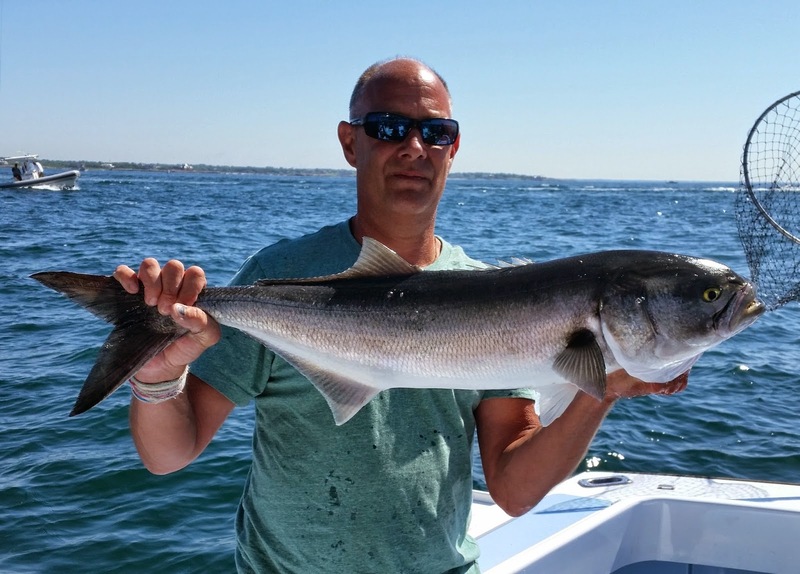 Gagliarducci will be the featured speaker at the Monday, June 30, 7:00 p.m., Rhode Island Saltwater Anglers Association (RISAA) seminar at the West Valley Inn, West Warwick. "There's a lot of things that come into play when fishing with plastics. You need to take into consideration the tides, water clarity and what type of bottom you're fishing on. Even the type of algae and plant life growing in the area helps decide what colors to use." said Gagliarducci. RISAA members are free, $10 donation for non-members. Visit www.risaa.org for details. Scup fishing picked up dramatically this week. Mike from Cardinals Bait, Westerly said, “Shore anglers are experiencing a good scup bite.” John Littlefield of Archie’s bait said, “Scup in the 12 to 13” range are being caught at Colt State Park, Ohio Ledge, and Conimicut Light. Some anglers have caught their limit.” Scup limit is 30 fish/person/day with a minimum size of 10”. However, a 9” minimum size prevails for shore anglers fishing only in special provision areas including India Point Park, Providence; Conimicut Park, Warwick; Rocky Point, Warwick; Stone Bridge, Tiverton; East and West Walls (Harbor of Refuge), Narragansett; Fort Wetherill, Jamestown; and Fort Adams, Newport. 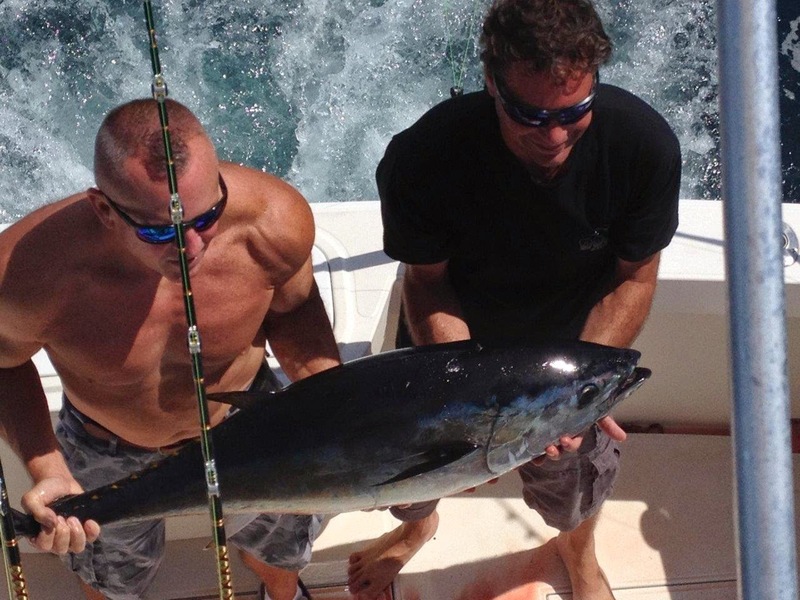 Offshore bite improved this week with several reports of bluefin being caught. Jack Leyden of North Kingstown fished 20 miles southeast of Block Island in the Tuna Ridge area Sunday. 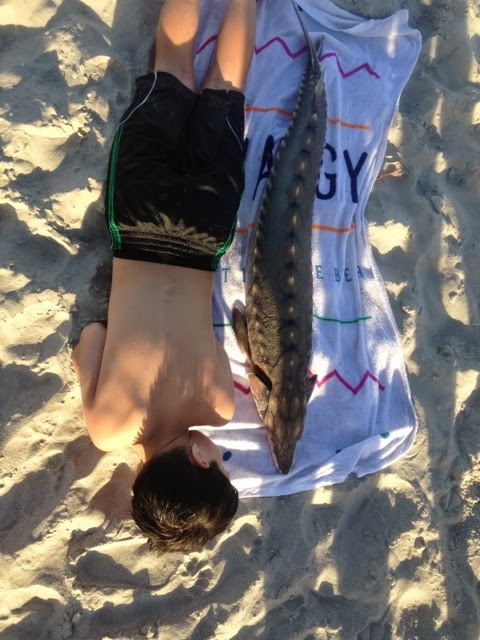 Jack said, “Caught a BFT (60 pounds) … trolling ballyhoo and artificials. Whales, porpoises abundant in flat calm seas.” Jack was fishing on Stepping Stone, a 45 foot Cabo. 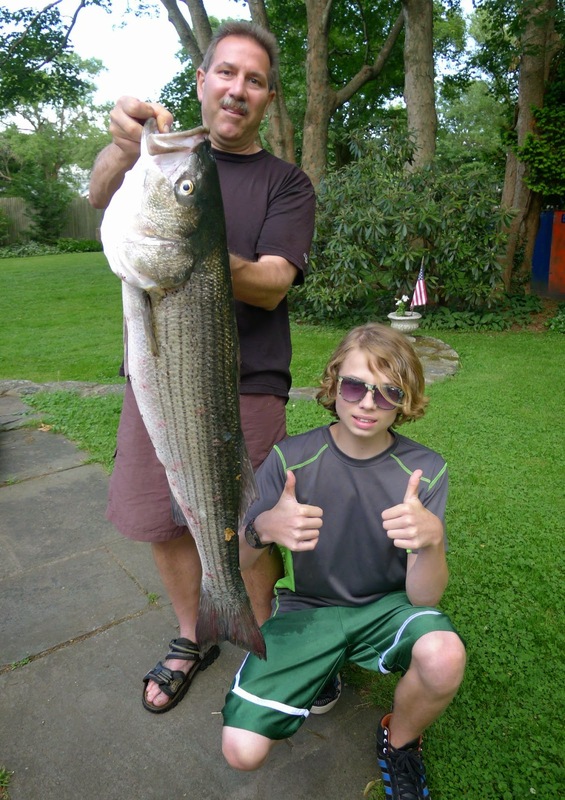 Quinn (Squid) Antonacci of West Greenwich, RI with the 22” black sea bass he caught on his grandfather Ken Robinson’s boat in the Brenton Tower area in 75 feet of water. Capt. Dave Monti (left) and Pete Sousa (both of Warwick) took Lester and Alex from Boy Scout troops in Providence fishing. Over 180 children fished during RISAA’s Take-a-Kid Day Saturday. “We wouldn’t miss Take-a-Kid Fishing day for anything.” said Capt. Robb Roach of Kettlebottom Outfitters, Jamestown. 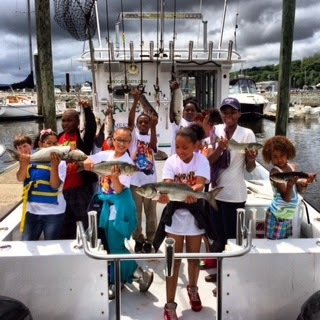 Shown here are young anglers on his charter vessel the Lacey J. Members of Jr. 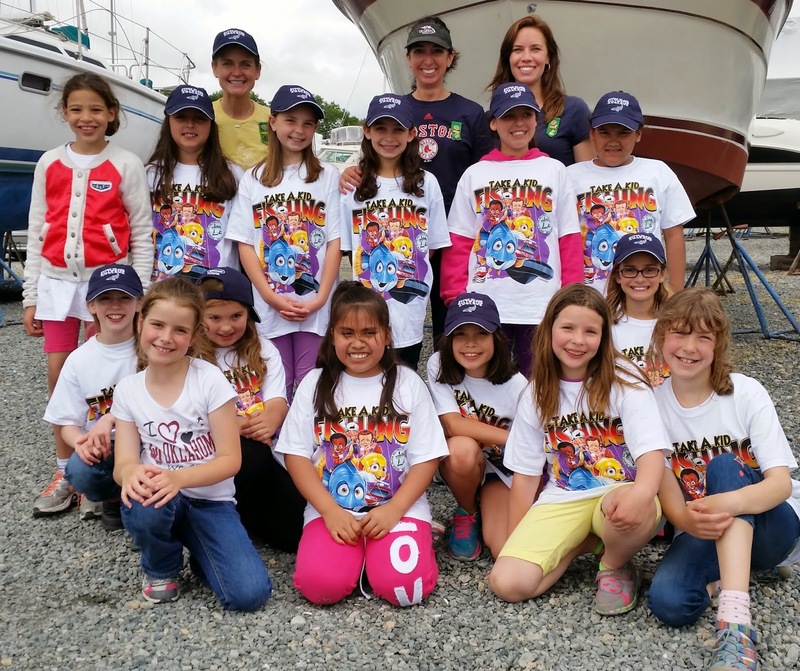 Girl Scout Troops 31 and 80 of Narragansett, RI all landed bluefish during the RI Saltwater Anglers Association’s Take-A-Kid fishing event Saturday. Troop leaders Mel Wathen, Marisa Lonkart and Kristen Maricas in back row. Black sea bass underwater: This back sea bass (with hook in month) was curious about Mike Laptew when he took this underwater photograph. Visit Mike Laptew’s website at www.laptewproductions.com for great underwater images. Chris Bellavance with black sea bass caught off Block Island on Priority Too Charters, Point Judith. 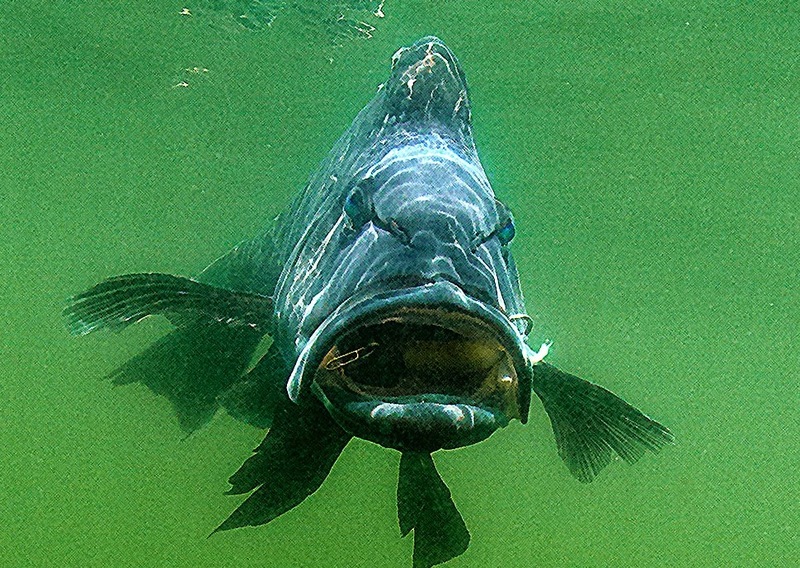 This year, the minimum size for black sea bass in Rhode Island is 13”. There is a shorter season and sub-periods due to a 7% reduction in quota for Rhode Island required by the Atlantic States Marine Fisheries Commission. The first sub period starts Sunday, June 29 and runs to August 31 with a three fish/person/day limit. The second sub-period runs from September 1 to December 31 with a seven fish/person/day limit. Black sea bass are primarily black (sounds odd), but they have the ability to adjust their color to blend in with the bottom with colors ranging from grey, brown, black to a deep indigo hue. They spend most of their time around the bottom and can be found near rocky areas, jetties, rips and like a lot of bottom fish, they like structure. Black sea bass are hermaphroditic fish… they begin life as female then turn male. Black sea bass put up a good feisty fight but they do not grow to be large fish in the Northeast. 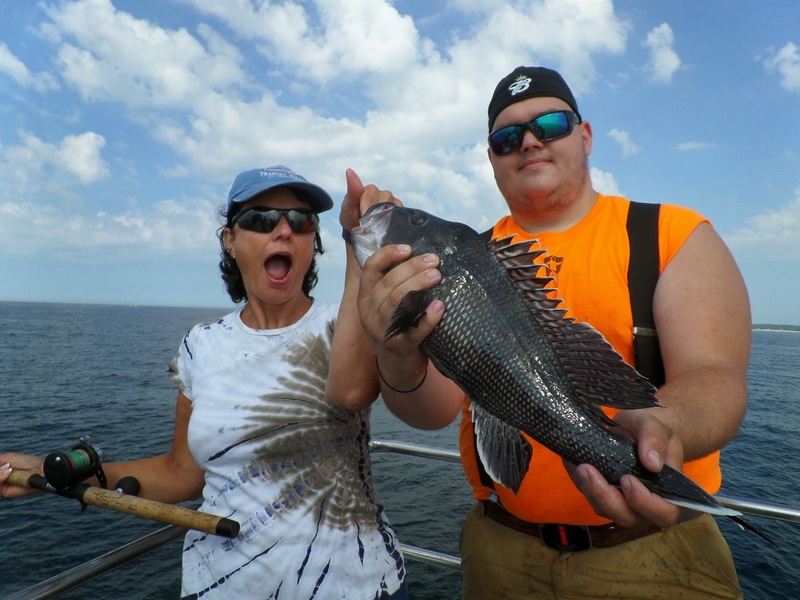 The largest black sea bass caught was 9 pounds, 8 ounces and about 19.7” long. Ideal water temperature for black sea bass is 59 to 64 degrees. Rigs often used to catch black sea bass have two hooks approximately 12” to 16” apart with a bank sinker to hold bottom. Squid or sea clams are most often used as bait. 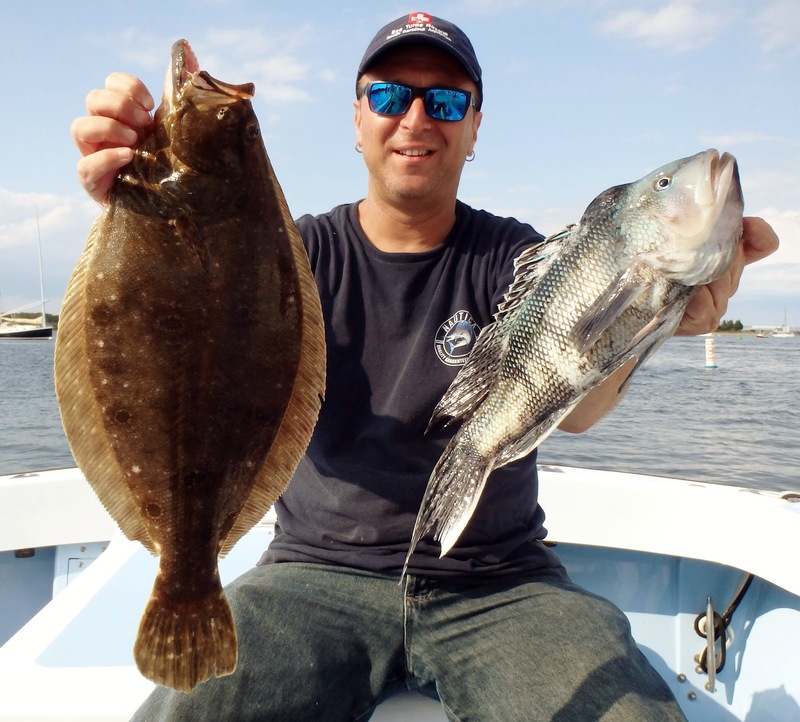 Anglers often catch them while fishing for summer flounder (fluke) or tautog because they are on or close to the bottom. They can also be caught with jigs and many prefer this method. The best time to fish for black sea bass is from May (if legal with an open season) through the summer, when they are closest to shore. Any underwater structures… rocks, wrecks, piers and jetties will attract black sea bass. The larger males are generally found in deeper water. Black sea bass is a delicate, sweet-tasting saltwater fish. The firm, white flesh of this species is a favorite of many. Bass are easy to fillet, especially when chilled, and yield a thick slice of meat. Some fillets are thick enough to slice lengthwise or to cut into nuggets for frying. Larger fish can be cut into steaks and cooked like striped bass. The Massachusetts Division of Marine Fisheries suggests broiling black sea bass fillets. When broiling, fold under the thin section from the tail area to allow more even cooking. Place the fish in a greased pan, sprinkle with fresh ground pepper and paprika, and dot with butter or olive oil. Broil 5 to 6 minutes on each side, depending upon thickness, until the fillets are golden-brown. Be careful not to cook too long, as the fillets will dry and become somewhat leathery. 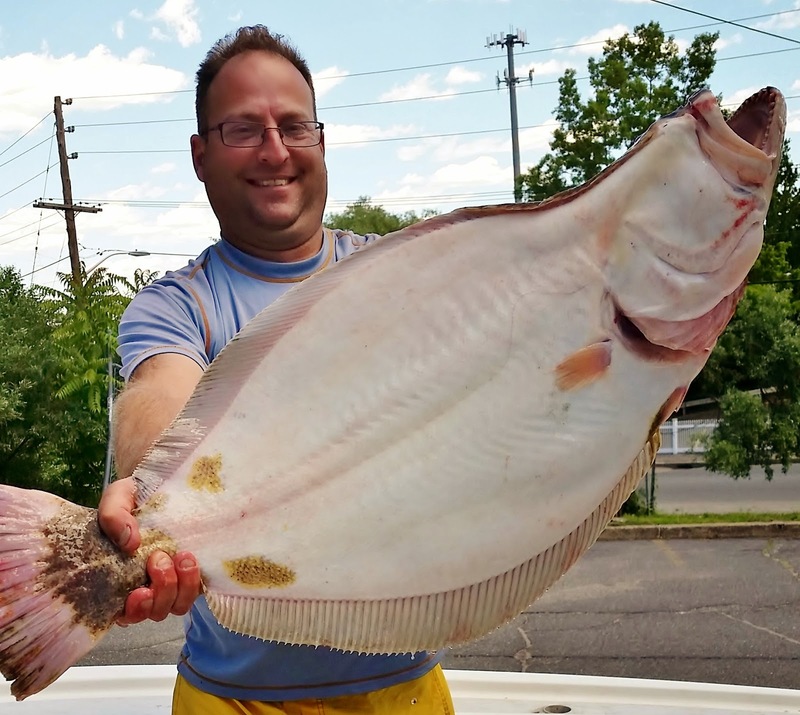 Kettlebottom Outfitters and Conanicut Marine (both from Jamestown) have created a new summer flounder (fluke) tournament called Flukefest, a one-day fluke tournament that will be held Saturday, June 21, 2014 from sunrise to 3:00 p.m. (weigh in at Conanicut Marine, Jamestown). The cost of the tournament is $40 for adults, $20 for 12 and under. Capt. Robb Roach of Kettlebottom Outfitters said, “It is very easy to register online at www.conanicutmarina.com.” There will be cash prizes for several categories including Heaviest Fluke, Heaviest three Fluke, Heaviest "trash" (non fluke) fish, Heaviest Shore-caught Fluke, and Heaviest Fluke 12 and under. Boat, shore, and young anglers are all welcome to participate. Visit www.kettlebottom.com or www.conanicutmarina.com for information and registration. The Narragansett Chapter of Trout Unlimited (#225 ) will hold its monthly meeting Wednesday, June 25, 2014, 6:00 PM, at the Arcadia Management Area Check Station, Rt. 165, Exeter, R.I. This will be the chapter’s second Stream-Side Meeting at the Check Station. Hot dogs, hamburgers and beverages will be available. Members and guests welcome. Contact Ron Marafioti, president, at (571) 643-1452 for information. Summer flounder (fluke) fishing has been good in the Bay. I fished the Warwick Light red bell last week with Dave, Ed and Richard Jacques (of North Kingstown). They landed six fluke, three nice keepers, at the end of an outgoing tide fishing the channel banks for about 1 ½ hours. Mike Cardinal said “Fluke fishing along the coastal shore has been steady with anglers are finding fish in 40 to 55 feet of water.” Fishing at the mouth of the Sakonnet River has been good too. “We weighed in a 7 pound, 4 once fluke this weekend that came from the Sakonnet. And, fishing under the Newport Bridge and off Ft. Adams has been pretty good too.” said Manny Macedo. Mitch Maloof of Breachway Bait & Tackle, Charlestown, said “The fluke bite is strong right off the beaches in 40 to 50 feet of water.” Roger Simpson of the Francis Fleet said, “There were quite a few limit catches recorded over the past week and quite a few hefty slabs between 7 and 9.5 lbs. 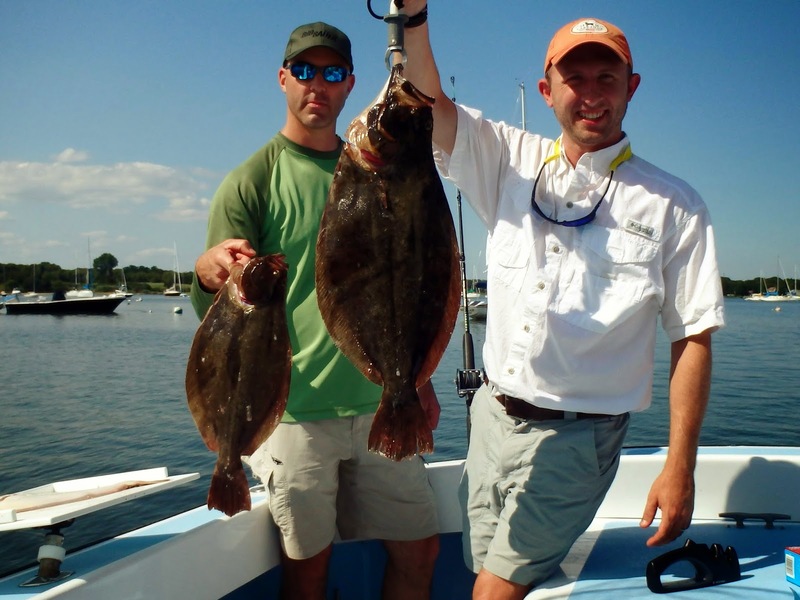 On most outings the average keeper is in the 3 lb range.” The minimum size for fluke in RI is 18”, eight fish/person/day. Scup fishing is heating up with large fish now being caught in the Bay at Colt State Park as well as along southern coastal shores.